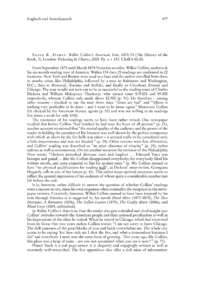 Susan R. Hanes: Wilkie Collinss American Tour, 187374 (The History of the Book, 3). London: Pickering & Chatto, 2008. Pp. x + 155. Cloth £ 60.00. From September 1873 until March 1874 Victorian novelist, Wilkie Collins, undertook his six-month reading tour of America. Within 154 days 25 readings are confirmed in 22 locations. New York and Boston were used as a base and the author travelled from there to nearby cities, like Philadelphia, followed by a tour to Baltimore and Washington, D.C.; then to Montreal, Toronto and Buffalo, and finally to Cleveland, Detroit and Chicago. The tour would not turn out to be as successful as the reading tours of Charles Dickens and William Makepeace Thackeray who earned some £19.000 and £9.500 respectively, whereas Collins only made about £2.500 (p. 91). He therefore  among other reasons  decided to cut the tour short since times are bad and [t]here is nothing very profitable to be done  and I want to be home again. Moreover, Collins felt cheated by his American literary agents (p. 53) and was not willing to do readings five times a week for only £350.